Take some of the hassle out of overnight business trips with the Contour Overnight laptop Roller. 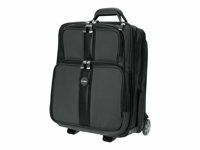 This rolling case features a flexible overnight compartment that adapts to your travel needs. The interior compartment has room for clothing and a water-resistant pocket for toiletries. The exterior pocket holds files and can expand into the interior pocket when you need more room. The 5-stage telescoping handle and stable wheel design provide smooth-rolling, wheeled comfort. The ergonomic Contour system enhances comfort while the SnugFit protection safeguards laptops up to 17 inches when on the road.